I'm sure that it's something obvious, but I haven't been able to find it on the Collatz website preferences, nor in the BOINC client's menus. I'm trying to reduce the GPU load a little, at the moment it runs around 96% load constantly and it causes the GPU's fan to get a little noisy (for me - I like piece and quiet). I'm using a HD5850, and just the standard ATi BOINC client v6.10.56. I've found numerous ways to reduce the CPU load, but not the GPU. Is it possible to do so? You edit the app_info.xml file by opening it with Notepad. I would suggest starting with <cmdline>w1.1</cmdline> This would increase the sleep time by 10% in relation to the prediction. If this doesn't give enough reduction in GPU load %, then try increasing the w parameter gradually until it does. So, w1.1 then w1.2 then w1.3 and so on. Using a lower GPU load will increase processing time. You need to stop and restart BOINC before any parameter changes will take effect. Installation of the optimised app is simple. 1) Stop BOINC by going to the advanced menu and selecting "Shut down connected client, click okay and then click cancel. Then exit out of the BOINC Manager. 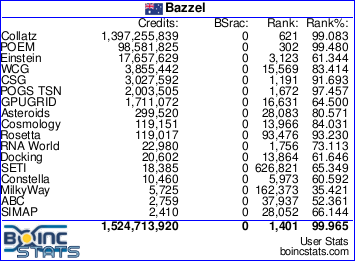 2) Copy the 3 files to your BOINC\projects\boinc.thesonntags.com_collatz folder. There is a file called "app_info.xml" included that will make BOINC use this app automatically. 3) Restart BOINC service by reopening BOINC Manager. BOINC will tell you that it found app_info.xml and is using an "anonymous platform". Kashi, you are a living legend. I was only really expecting some links in the right direction, not a whole step by step guide. It solved my problem in brilliant fashion. Many kudos to you! The simplified installation instructions at the end were not written by me but are a slightly edited version of the instructions written by arkayn which he added to the optimised MilkyWay applications which he hosts on his site. Actually, i have the opposite problem. I have a HD6850 and a HD6870 in crossfire-x. Running Collatz on WinXP and i7. The 6850 runs at above 95% GPU load, but the 6870 only sits around 70% GPU load. is this because it's in a crossfire setup and the 6870 has to "compensate" for the 6850? Any ideas anyone could share to help correct this problem? 1. If you are using all 8 cores on CPU projects, then it is possible the 2 GPUs are a little starved of CPU resources which causes a lower GPU usage percentage. To test this, suspend all CPU tasks and see if the GPU usage increases to 99-100% on both GPUs. If it does then you can configure BOINC to use 7 cores instead of 8 and it should help. It will reduce WCG hours by 12.5%, so will affect badge hunting slightly but it should not affect total throughput of WCG work very much at all. This is because on hyperthreaded CPUs, the tasks speed up slightly when not all CPU cores are used. Why it affects one GPU much more than another with crossfire I don't know. When my CPU is overcommitted and GPU processing slows down, it is the second core of my HD 5970 that slows down with a lower usage percentage. HD 5970 has internal crossfire so the principle is the same as you are seeing. For some reason this happens greatly if I am using VirtualBox Linux CPU crunching and my Windows GPU only BOINC switches to DNETC when MilkyWay runs out of work. 2. You could try the instructions above to install the Version 2.09 Optimised Application. The correct version for Windows 32-bit is Win32_2.09_ATI.zip. Best to complete all Collatz tasks in your cache or abort them before installing. Now instead of going above the default wait value of 1 you need to try going below. I would suggest starting with <cmdline>w0.9</cmdline> This would decrease the sleep time by 10% in relation to the prediction. If this doesn't give enough increase in GPU load %, then try decreasing the w parameter gradually until it does. So, w0.9 then w0.8 then w0.7 and so on. You need to stop and restart BOINC before any parameter changes will take effect. Using a higher GPU load will probably increase GPU temperatures, so make sure that your GPUs do not overheat, in particular the VRMs. If it is lack of sufficient CPU resources to support 2 GPUs crunching (as in 1. above) then adjusting the w parameter will probably have little to no effect and you will need to leave a CPU core free if you wish to get full speed GPU crunching on both your GPUs. Either that or continue crunching on 8 CPU cores and live with the slight slowdown in GPU crunching. Your choice. Other than the strange VirtualBox exception, one of the advantages of DNETC with multiple GPUs is because it runs one task on both GPUs it needs very little CPU resources to support crunching on multiple GPUs. Collatz on the other hand uses more CPU resources to support GPU crunching at full speed than MilkyWay because unlike other ATI GPU projects it requires high GPU memory bandwidth.